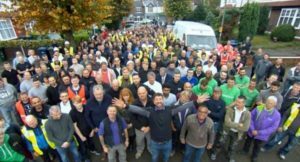 The Hireman donated a range of site equipment to the DIY SOS The Big Build team to help with the rebuild of PC Kris Aves’s home in Barnet. The show aired on Wednesday 7th March, and if you saw it you’ll know Kris’s story. 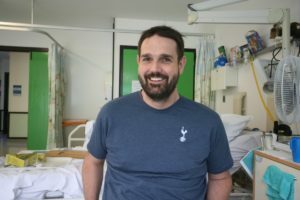 Kris was returning from a ceremony where he had been awarded for his work as a police liaison officer with the Metropolitan Police when he was caught up in the Westminster Bridge terrorist attack. He was left with serious injuries after being run over by the terrorist’s car while crossing the bridge. Kris was unable to return home for months after the attack. With a house completely unsuited to his new needs he was stuck in hospital. Narrow corridors, no downstairs toilet and a front door were just some of the issues facing the DIY SOS team when they arrived to refurbish the property. Hundreds of volunteers were involved in this project, so many wanted to help that they actually had to turn people away! This is the second time we have donated equipment to a DIY SOS The Big Build project. This time we provided a wider range of kit, including; wheelbarrows, steps, heaters and lights, which we were only too happy to offer. It was a huge honour to be just a small part of this effort. We gathered alongside the many other people who had helped out with the build for the Big Reveal. Predictably, it was a grey English morning but the weather wasn’t enough to dampen anyone’s spirits. It was lovely to see the whole community come together in support of Kris and this really came through in the show. Kris’s positivity really shone throughout the programme too, despite all that’s happened to him. People came from all over to help out, memorably for us a local baker turned up unprompted with an enormous cake to celebrate the occasion. It was also inspiring to see how many members of the Met Police had volunteered their time to be there and help. It took 10 days hard work from a whole range of tradesmen to transform the house. The finishing touches were put on minutes before the Big Reveal as we all trekked up to see the house. After the final bits of filming both Kris and Nick gave moving speeches thanking everyone, and Nick emphasised how this sort of community effort shows what we can achieve when we all work together.